Want a fun twist on putting partially filled ten frames together to make ten? 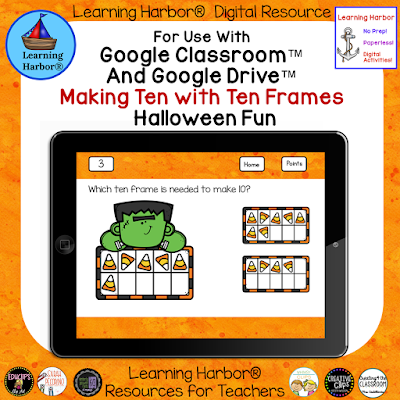 Here is a resource designed to be used with Google Classroom™ or Google Drive™. On each slide the student will see Frankenstein or a vampire holding a ten frame. The student them decides which of the other two ten frames would make 10 when combined with the ten frame that the character is holding. The student then clicks on the ten frame that he chooses as his answer. The large graphics make it easier for kids to click on and this game is appropriate for kindergarten and Pre-k students. It is also teacher friendly.